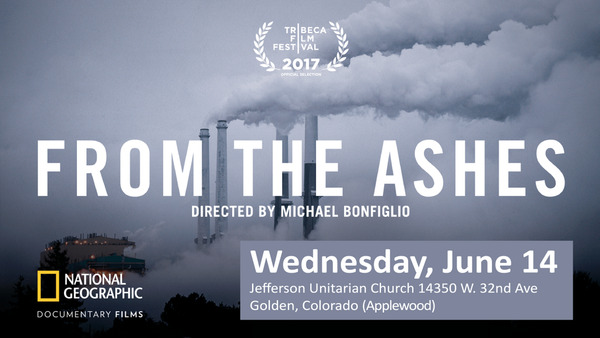 A compelling look at the lives and issues behind the “war on coal, ” From The Ashes premiered at the 2017 Tribeca Film Festival and will air globally on National Geographic this summer. See it at Jefferson Unitarian for free thanks to a campaign by Interfaith Power & Light. Movie trailer at www.fromtheashesfilm.com. Please stay afterwards to discuss positive actions towards a clean energy future. Several Colorado cities are starting to set goals for 100% clean energy – we’ll clue you in to these local efforts to make hope real. BYOB, and we’ll have some snack foods. Our CRES Speaker Series is usually on 4th Thursdays. This month: Th, June 22: H2@Scale – Can Hydrogen Save our Energy System? Looking back: Check our CRES Youtube channel for talks you missed here or at other chapters. Note that slides are digitally inserted and fully readable in the videos. Plus: Youtube provides a running transcript if you click …More under the video. Who knew?! !